(CNN) -- The expulsion of a U.N. official from Sri Lanka is final and he has to leave the country by September 21, the government has told the agency. 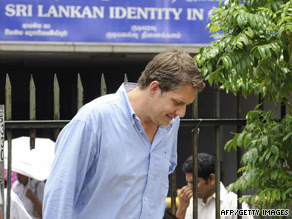 James Elder, spokesman for UNICEF in Sri Lanka has until September 21 to leave the country. Officials with the United Nations Children's Fund met with Sri Lankan officials on Monday in hopes of keeping James Elder inside the country. But Sri Lanka stood firm in its decision, and has issued UNICEF an expulsion notice for Elder, said Sarah Crowe, the agency's spokeswoman for South Asia. The Sri Lankan government has accused Elder of spreading propaganda supporting Tamil rebels. Ann Veneman, UNICEF's executive director, said the agency was "extremely concerned and disappointed" with the decision. "Through Mr. Elder, UNICEF has consistently spoken out against the suffering of children on both sides of the intense hostilities earlier this year and called for their protection. UNICEF unequivocally rejects any allegation of bias," she said in a statement Monday night. Elder has often spoken to the media about the agency's concerns about children caught up in the country's civil war and the conditions they endure at camps for the displaced. "Mr. Elder's role for UNICEF was to reflect how the conflict gravely impacted upon children," Crowe said. "He did this based on concrete information that the United Nations attained and verified." Crowe called Sri Lanka's allegations regarding Elder "outrageous" and "contradictory." "They are bordering on the ludicrous," she said. The Sri Lankan military finally defeated the Tamil Tigers earlier this year, after a conflict that began in 1983. The rebels -- formally known as the Liberation Tigers of Tamil Eelam (LTTE) -- were waging war for an independent state for minority Tamils in Sri Lanka. As many as 70,000 people were killed in the conflict. In February, Elder told CNN that children as young as 4 months old were being treated in hospitals for shrapnel injuries and other wounds of war. The fighting created a "nightmarish" situation for civilians in the conflict zone, Elder said at the time.